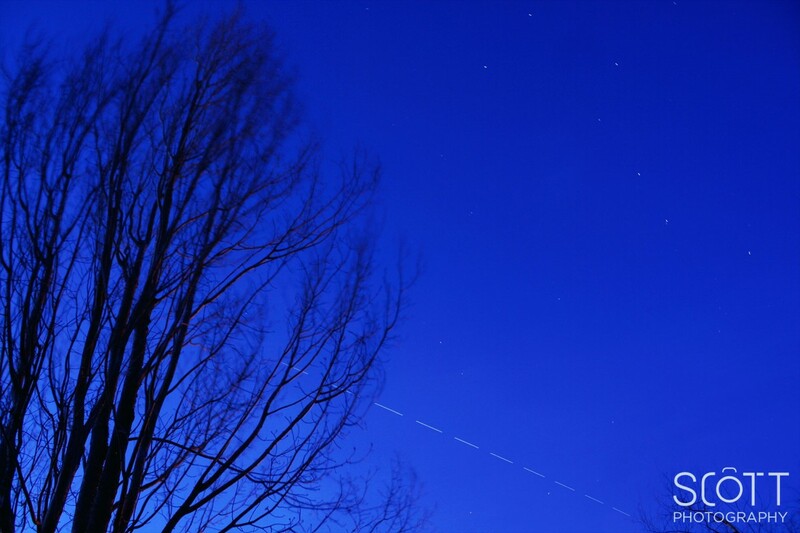 After arriving home a bit late from my workout, I decided to find out when the ISS was going to pass by my house. I realized that I only had 15-20 minutes to set up my equipment. I grabbed my tripod, attached my camera to it, and little did I know, my camera battery was completely dead. Hastily, I put the battery on the charger and gave it a quick charge (5-10 minutes). In the nick of time, I ran outside, extended the legs on my tripod, framed the shot and luckily I was able to capture the photo(s) above. Each photo in the composite above had a 5 second exposure time. The single photo above is a combination of ten 5-second photos which makes for a total exposure time of 50 seconds. I used Photoshop to combine the photos and made sure to select the Screen layer mode when doing so. The Screen layer mode is important here because it essentially creates a mask to ensure only the brighter parts of the images are “visible”. It really is a lot more complicated than that, but you get the gist. The process is really quite simple. In fact, there’s even a Photoshop Action that you can download and use in your star trail (or ISS) photos. In the end, I managed to capture a photo of the International Space Station and the Big Dipper (top right), which was a happy accident for me. I honestly did not know that the Big Dipper would be in the shot when I framed it. I’m really quite pleased with the outcome. What do you think? This entry was posted in Long Exposure, Space and tagged in Big Dipper, International Space Station, ISS, NASA, Space, Stars.